Working closely with World Champion Alex Pastor we focused relentlessly on fine-tuning the performance characteristics of the Airush Razor. 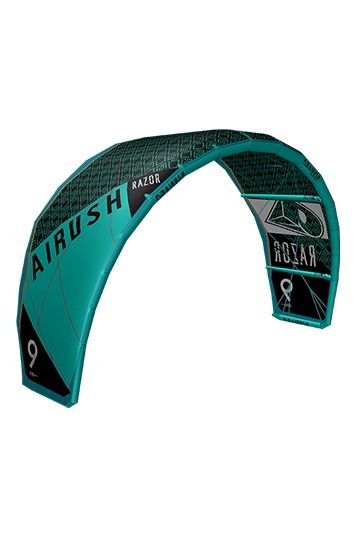 Even while specifically focusing on mind blowing pop, unhooked ability and kite looping, the Razor also features an incredible wind range and ease of use, way beyond the expectations of a purist freestyle kite. WebTech expands our exclusive Dyneema Load Frame throughout the high load areas; like the wingtips, by utilizing the web fibers to absorb high loads, increasing the durability and response rate of the kite further. The 2018 Razor brings improvements to its construction with the new lightweight load-frame, bringing extra durability without compromising on weight. People familiar with previous razors will notice an increase in bar pressure this year due to the tighter 5th line, which gives the kite a super solid and connected feeling. This kite's bread and butter is for unhooked riding, aggressive freestyle and boosting and looping, but still maintains good levels of user-friendliness. In terms of performance for handlepassing the razor continues its legacy of being at the top of the tree - excellent bar-feel and explosive pop and slack characteristics make it . On the blue setting the razor is a little more freeride oriented and benefits from increased windrange, but the red trades off some of this for more explosive pop, boosting and improved relaunch. The excellent narrow-diameter bar continues this year, with reliable comfy grip, beefy flying lines and a new leashing method which requires no carabiner. All in all, if a C kite is your cuppa tea, there isn't a better choice out there - the best keeps on getting better!